Pimenton is a smoked version of paprika, which is ground up red bell peppers. It isn’t really something new… all you cool kids out there have been playing with this for a while. It used to be sort of hard to find smoked paprika. Luckily for us lazy guys, it is becoming increasingly easier to find, and more popular. I first came across the McCormick version at my local Safeway. A couple weeks after that I found this version from Safinter. The McCormick paprika was good, it tasted smokey and was sweet, but it had no complexity or depth. The paprika from Safinter was miles better. This paprika has much more complexity, you don’t just have two boring notes, but instead a number of different lingering smokey notes and a range of sweet flavors. A little bit of this stuff goes along way. The price difference between the two brands I bought was only about a $1.50, and each bottle will last forever. I recommend paying a little extra and going for a slightly more expensive bottle. You will definitely notice the difference. Try adding it to anything that has tomato in it, anything you roast…or really anything. Reading around it seems like version from Penzeys has been getting rave reviews.You can also get some authentic versions from Spain from La Tienda. 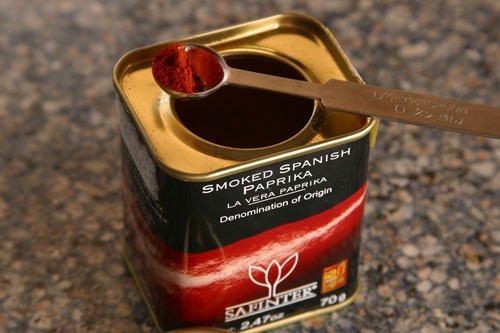 hi i recently bought some of your smoked spanish paprika from a local chilli farm and every since then they have not managed to get any stock of it could you tell me where i can get it from in the uk around the cheshire area thankyou very much mr m gaskins. I usually don’t comment this often on other’s sites, but you’ve got my attention with all this Spain talk. We’re kind of obsessed with the country and are going back for our 3rd time this summer. Paprika is so underrated in America!! It’s such an amazing spice and makes so many dishes perfect. Also, La Tienda is an awesome site to buy all things Spanish. I just started peeking around your site and I already see 2 things about Spain (octopus tapa and this). If you’re interested in Spanish stuff, check out our site b/c we have about 8 posts on Spain including cocido, fabada, cabrales, tame tapas, crazy/interesting tapas and others. I’ll keep poking around your site!